Schedule Content makes posting scheduled content to your website easier. It automates the publishing of content blocks based on whatever schedule or time period you specify. This flexible web service gives content managers and website owners ability to post content for a specific period of time and then, remove or replace that content with new information. For example, if your store typically has a discount or incentive on Tuesdays, Schedule Content makes your coupon or discount announcement available only on Tuesday, every Tuesday, automatically! Need more? You can run a different announcement for other days of the week. 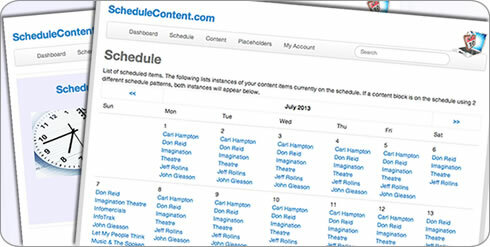 Once the content and schedule are set, Schedule Content automatically changes out the content. The system is compatible with most existing websites. Management of Schedule Content does not require your webmaster or hosting company to make these changes…you can! For more information and availability, please call 541-223-7444 or contact us here.